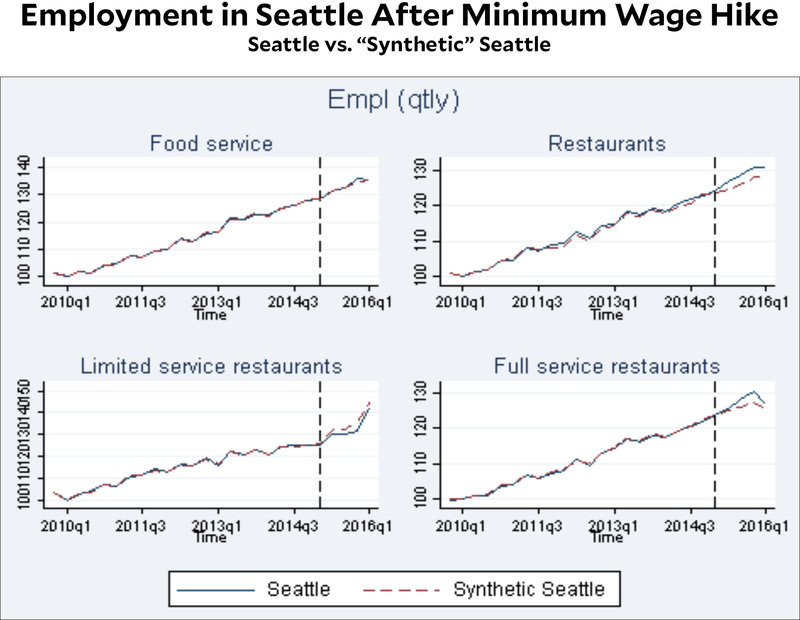 Brad DeLong points to the latest study of employment in Seattle as it steadily increases its minimum wage to $15 per hour. As usual, what we want to know is not what absolute employment in Seattle looks like, but how it compares to a similar city with a lower minimum wage. Low-end labor markets simply do not appear to work like competitive markets. Rather, they work like markets in which employers have substantial market power—and thus minimum wage laws have the same efficiency benefits as does natural-monopoly rate regulation. Why low-end labor markets do not appear to work like competitive markets is a very interesting—and, I believe, unsolved—question. But it is in all likelihood a fact to deal with. I’d add an obvious caveat to this: it’s possible that a modestly higher minimum wage has little effect when the economy is doing well. We don’t know yet how employment in Seattle will respond when the economy turns down.